← This quote is a KEEPER!! Help ‘The Way’ documentary get in Netflix. Easy. Fast. Oh, and be sure to share with your friends!! By condensing our film suggestions into a set period of time, we’ll raise the volume of our collective voice. So join in with your friends, family and Shabbat fellowship! Suggesting the film only takes a few seconds and you only need to suggest it once per person. 1. You (and your friends) would be able to watch The Way for FREE when you sign up for a FREE 1-month trial on Netflix! 2. 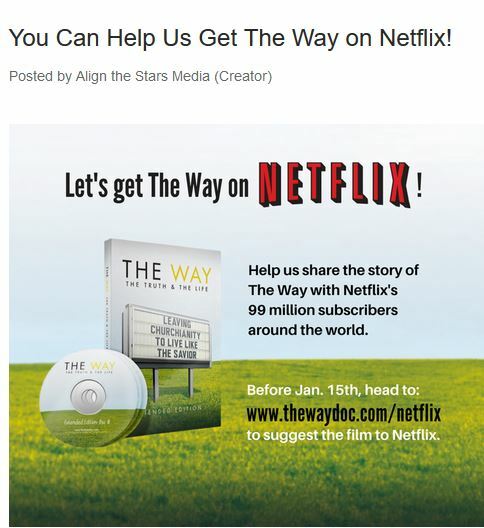 Netflix’s 99 million subscribers around the world will have a chance to encounter the message of The Way. Thank you so much for your prayers, encouragement and support! No matter what happens, we’ve seen our Heavenly Father take this film to the far corners of the earth, and we pray that He’ll continue to use it in whatever way He has planned. This entry was posted in A Thought... and tagged Build the Kingdom, Hebrew Roots, Luke and Kayte Abaffy, Netflix, share truth, The Way Documentary. Bookmark the permalink. 3 Responses to Help ‘The Way’ documentary get in Netflix. Easy. Fast. We use PureFlix as well. Great idea. Will pass along! The Way…Let’s Help Luke and Katye.